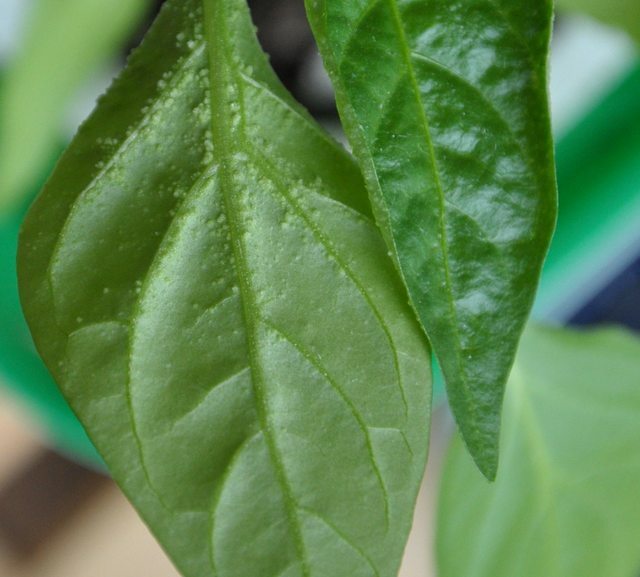 Today I noticed on my pepper seedlings that some of the leaves have on their bottom-side close to the steam some light-green-dots. To my uneducated eyes this looks like something is hatching inside the leaf. While rubbing and scratching I was not able to remove it. EDIT: adding info as per Anubis request: Peppers are indoors using currently in a mix of self-made compost and garden soil. Further inspection shows that only one kind of plant (but of it all seedlings) is infected: only the peppers are affected and not the chilis which are in the same mini-greenhouse (I didn't used the top of the green, only the pots). What is it and do I need to intervene, if so how? Related or not but some of the leaves show white/dried-out zones on the top. Is this the result? I'm going to make a prediction that the spots will turn brown and possibly kill the leafs. 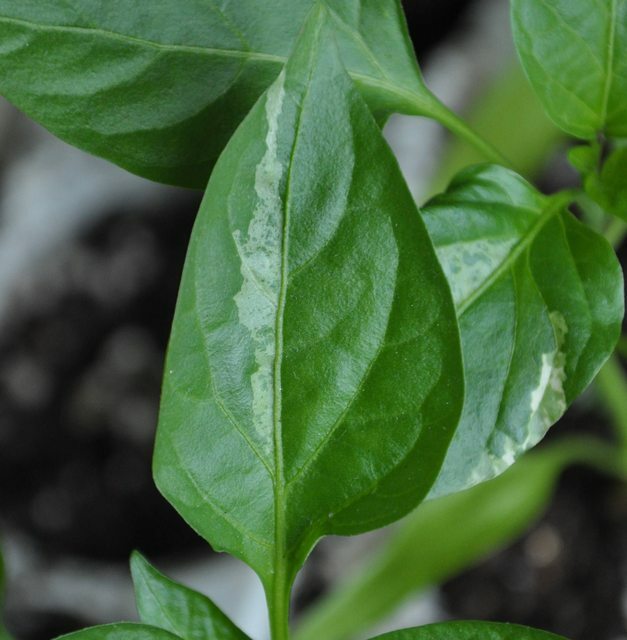 This is based on a guess of it being one of the many less than entirely common bacterial or fungal infections that can infect peppers and that it was likely brought in on the garden soil you used, combined with susceptible young plants. Since a lot of pepper plants are bred to be resistant to a wide variety of these kinds of infections, it would make sense why one would be displaying signs while the others would not. While it's vaguely possible for this to just be some genetic quirk of the specific breed of pepper I wouldn't place any bets on it, I haven't been able to find any mention of such quirk on any gardening site or blog at this time. I'd recommend isolating the potentially infected plants by themselves, away from all other seedlings. See if the spots get worse or turn yellow/black. If you use gardening tools on them, be sure to dip the tools in bleach water before using them on other plants, so as not to spread potential infection. Not the answer you're looking for? Browse other questions tagged diseases pests seedlings peppers or ask your own question. What should I do with hot pepper seedlings which are less than an inch apart?